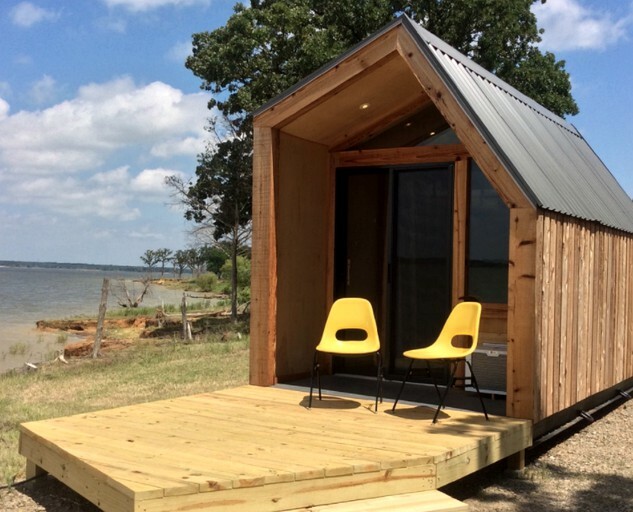 An example of glamping at its best, this modern ‘tiny house’ is right on the banks of Lake Texoma, Texas, and can accommodate up to four guests. 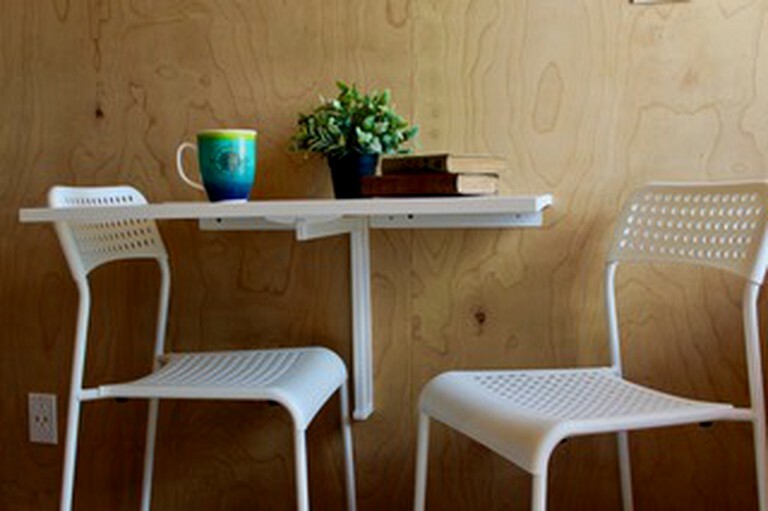 This ultra-efficient construction consists of one room and a full loft. There is a king-size bed and one children’s bed in the loft. 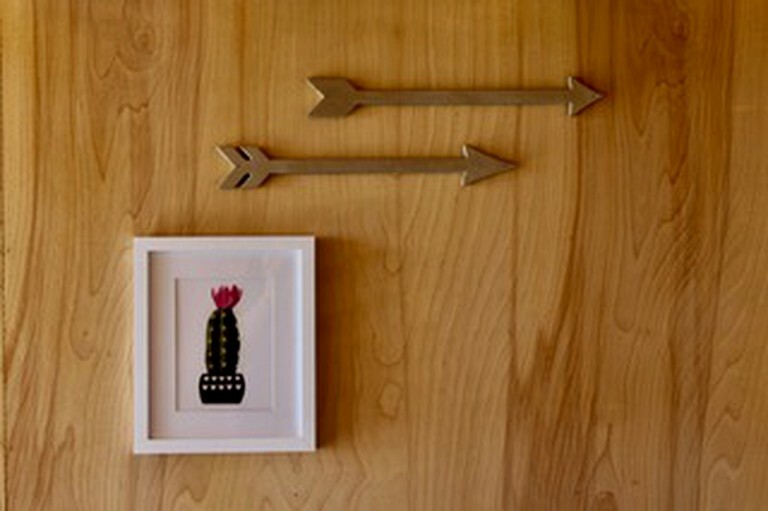 The ‘tiny house’ does not have a kitchen or a bathroom, giving guests the most authentic camping experience with a welcomed touch of glamour. The property can be heated and air conditioned, depending on the weather and the season. 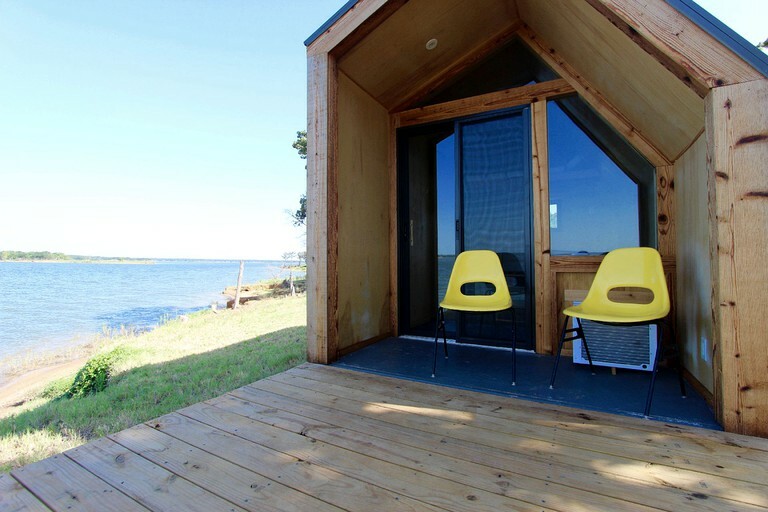 These one-room kasitas are glamping at its finest. 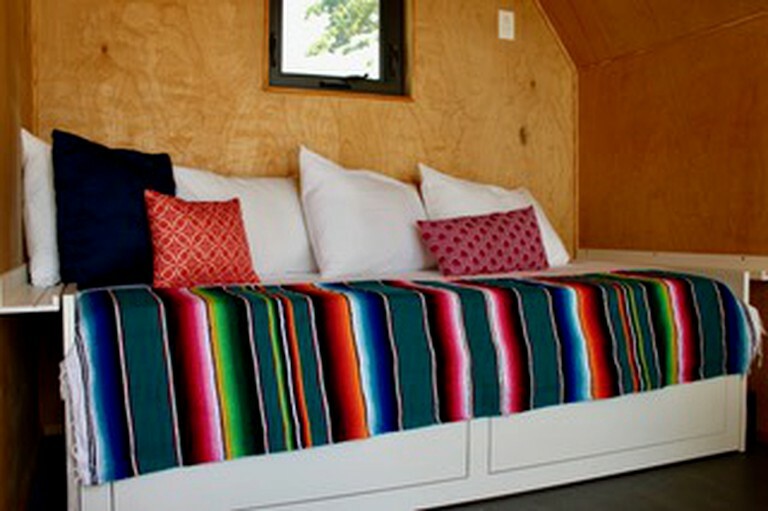 Each kasita has a king-size daybed, a full loft perfect for kids, and indoor and outdoor seating. There is an air conditioning unit that keeps the unit chilly in the summer and warm in the winter. The rental has electrical outlets and lighting, including USB power outlets, an incredible firepit, an outdoor sink, and a barbecue grill. 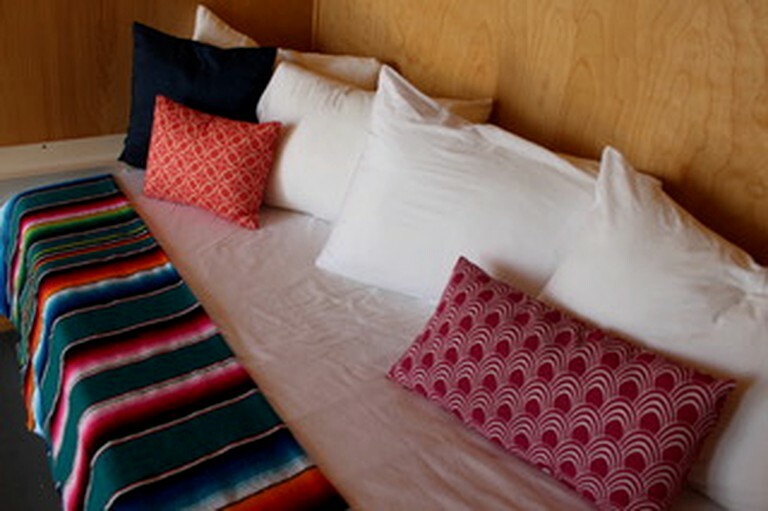 Linens are provided for the beds, and the bathroom and shower facilities are just a short walk away from the rental. Each cabin can sleep two adults and two children. Guests should be sure to stop by the Hammock Garden close by to relax, meet other glampers, or make some drinks at our community bar. When guests choose to stay at this idyllic and unique spot, they are choosing to escape the hustle and bustle of the modern world and take it easy for a while. 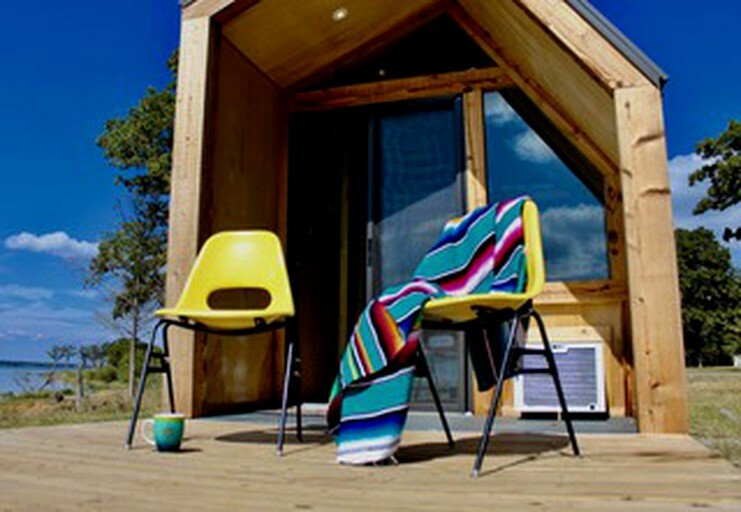 The hosts offer experiences in cabins and tiny homes, and guests are also welcome to bring tents, RVs, and campers. Vintage campers are especially liked here, and the hosts look forward to welcoming all those travelers filled with wanderlust or searching for adventure in this beautiful landscape. Located on the banks of Lake Texoma, there are a wealth of water-based activities that guests can take part in during their stay. It is ideally placed for fishing and picnicking, overlooking the stunning lake, and kayak and paddleboard rentals are available from the resort itself. The various nature reserves that surround the property make it the perfect location for wildlife lovers, particularly Hagerman National Wildlife Park which is a haven for migratory birds – perfect for any wildlife photography enthusiasts. As this is a family-friendly resort, guests are asked to keep noise to a minimum between the hours of 11 pm and 7 am.